Three Homer City Council members survived a recall effort promoted by local conservatives over a resolution that broadly endorsed tolerance and inclusion but originated as a pointed critique of President Donald Trump. Close early results Tuesday fell away Friday as the three council members — Catriona Reynolds, Donna Aderhold and David Lewis — held onto their seats by wide margins. The final results were announced Friday evening after Homer elections officials spent the afternoon recounting ballots, the Homer News reported, blaming voting machine problems for a disparity in the count between ballots and voters. Reynolds, Aderhold and Lewis were accused of lying to cover up their roles in a so-called "inclusivity resolution," which some saw as an effort to turn Homer into a sanctuary city. More than 1,000 Homer residents cast ballots at the polls Tuesday and hundreds more voted early, capping a tumultuous chapter in Homer's history that drew national attention as an emblem of America's polarized politics. The turnout was about 42 percent. On Tuesday night, with only about half the votes counted, Reynolds was running the tightest of the three races, keeping her seat by roughly three dozen votes in the early count. By the final, she retained her seat by 223 votes, or 56 percent of the total cast. Aderhold held her seat by 274 votes, one more than Lewis received. 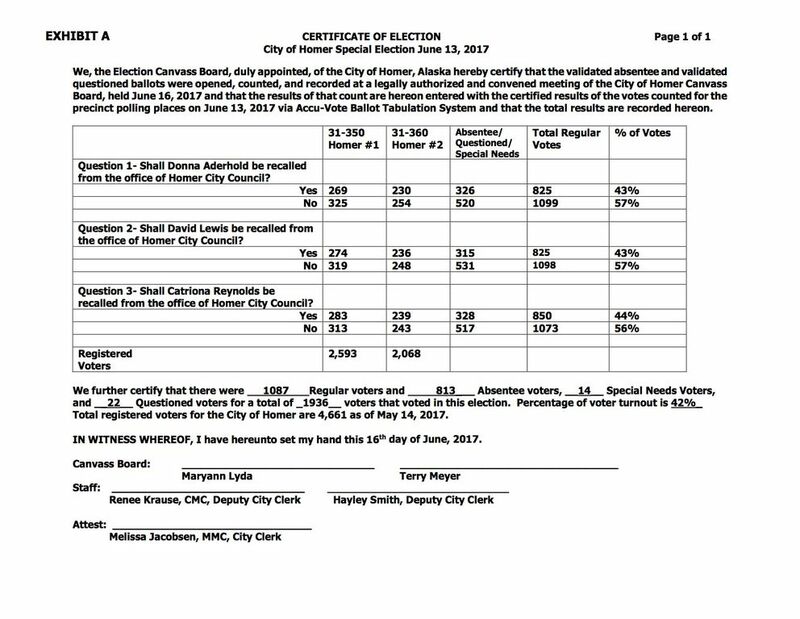 Because of rounding, each took 57 percent of the vote. In a phone interview Saturday morning, Reynolds — the one council member to support the February resolution — said she was gratified by what she saw as a decisive vote. "The tone nationally, globally, locally … if (people) don't like something that's the opposite of their opinion, they're very harsh about it," Reynolds said. "I'm just hoping that this result will help set a tone that this is not OK."
Looking back, Reynolds said, she wished she'd been more "pragmatic and intentional" in pursuing her goals of promoting inclusivity and non-discrimination policies. In a statement Friday morning before the final vote count, Sarah Vance, a spokeswoman for the pro-recall group Heartbeat of Homer, insisted the recall effort was a success, regardless of the outcome. "Every time we take a stand to hold our leaders accountable, take responsibility for our own actions, and defend truth; we win!" Vance wrote in the statement. Reynolds and the other two council members sued to stop the recall through the American Civil Liberties Union of Alaska. In late May, an Anchorage judge ruled against the council members, saying that free speech wasn't a shield for a recall initiated by voters. In exchange for not appealing the case to the state Supreme Court, the city of Homer has agreed not to pursue recouping a portion of its legal fees from the ACLU, according to Reynolds and an ACLU spokesman. Members of an election canvass board met Friday afternoon to count the remaining ballots. But the clerk's office had discovered an 18-vote difference between the number of voters who signed voting registers Tuesday and the number of ballots that were counted, the Homer News reported. The discrepancy stemmed from problems with the optical scan voting machines not accepting ballots, city clerk Jacobsen told officials in a memo. On a community Facebook page earlier this week, in between posts about boat mechanics and lost-and-found buoys, Homer residents have traded last-minute views on the recall election. Some bemoaned it as wasteful and unnecessarily divisive. By Saturday morning, this sentiment was emerging: "Let's move on." Reynolds said she does plan to move on. But she said she didn't expect all of the relationships she had before the recall to be the same. She also said she, like Lewis, no longer plans to seek re-election this fall. Aderhold is up for re-election in 2018. 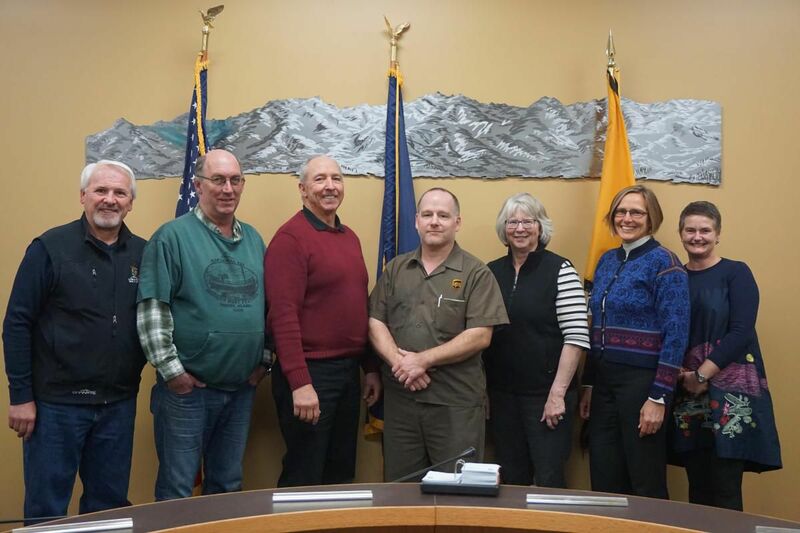 In the statement from Heartbeat of Homer, Vance struck a conciliatory tone toward the three council members, applauding their volunteer efforts and community commitment. The recall, Vance said, had "blown a strong wind of change through our sleepy little town, and it is now up to us, as a community, to determine how we proceed."